This year Scouting for Food will take place on the first two weekends of November. November 5: Scouts canvas their neighborhoods with door hangers. These door hangers explain Scouting for Food’s purpose and ask households to place a bag of non-perishable food items by their doors the following Saturday for pick up. November 12: Pick Up Day! Scouts return to the houses they left door hangers with the previous week and pick up the bags of food. They take the food to a drop off point where it’s weighed and added to others. At the end of the day the units distribute the food to local pantries and food banks. Price Chopper To Partner With The Boy Scouts on Scouting For Food! Price Chopper is committed to serving local communities by helping reduce food insecurity. 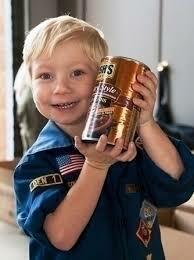 That’s why they have agreed to partner with the Boy Scouts in 2016 on the Scouting For Food project. With all collected food going to local pantries Price chopper and the Boy Scouts are working together to ensure that our friends and neighbors have enough to eat in 2016.